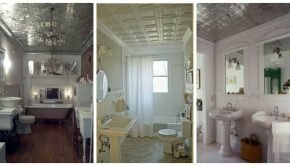 Yes, we are obsessed with decorative ceiling tiles and now we have visual proof of their amazing ability to completely transform a room from drab to fab in a few hours. 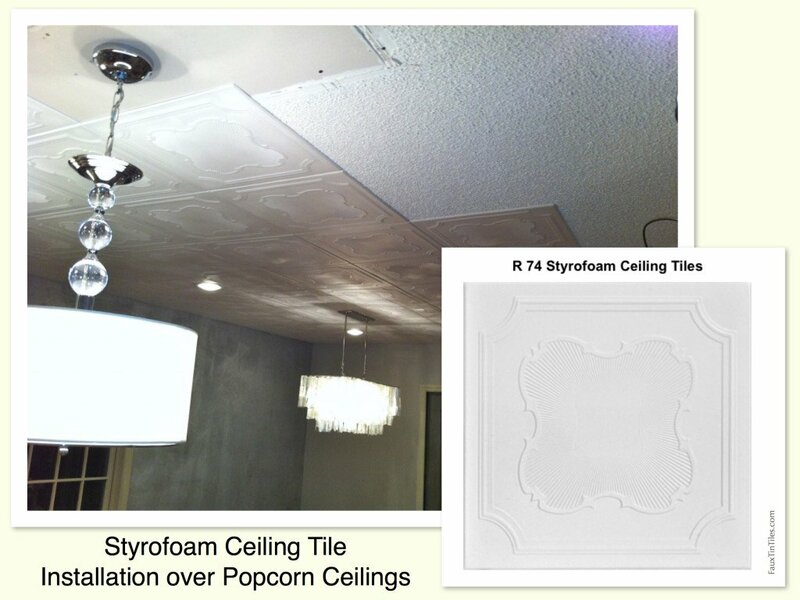 More specifically they are a beautiful solution to a common problem – torn apart and ugly popcorn ceilings. When we bought our first house we hired a company to come in and remove the popcorn ceilings in the master bedroom. Just this one room cost us a fortune and although the particular company we hired kept the mess to a minimum, we still needed to spend even more money on dry wall repair and painters after the ceiling contractor finished his end of the project. 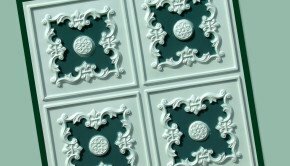 Had we known about styrofoam ceiling tiles back then, it would have been a hands down no brainer fix to a common home improvement problem. In fact, we probably would have installed ceiling applications throughout the house. 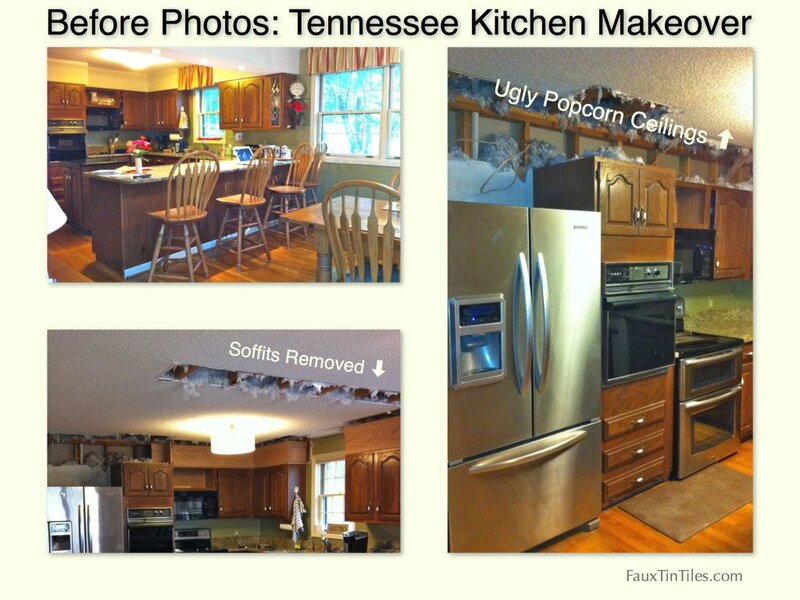 So when we happened upon Dana Tucker’s blog post Our New House Kitchen Makeover, we couldn’t wait to share it with you. First of all, Ms. Tucker has done a beautiful job on the entire project. There really is nothing we would change and if you have read some of our other posts, we are none too shy about offering our ever so humble opinion on anything and everything. 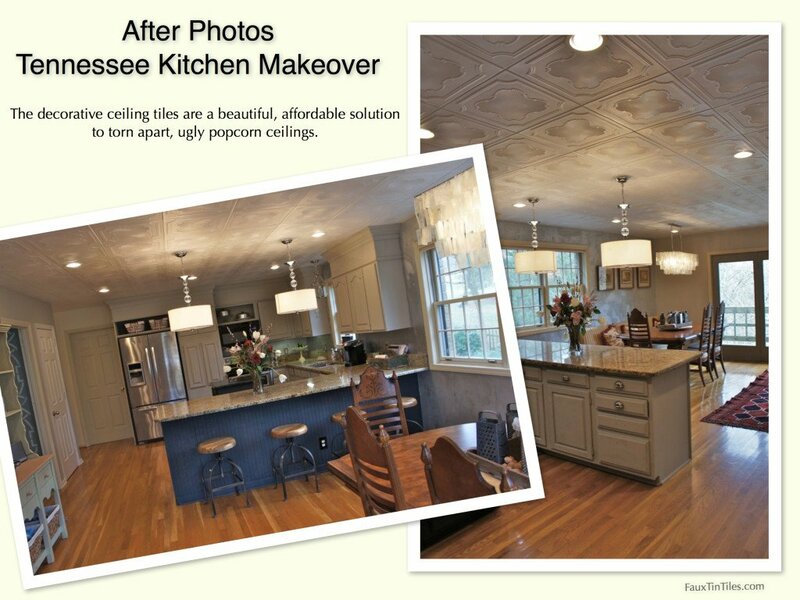 We love the colors she has chosen, her stainless steel appliances, her light fixtures (especially the Capiz shell chandelier) her specialty cabinet and wall paints, and most of all we love, love, love the way she used styrofoam ceiling tiles to cover the holes left after removing the soffits and to mask the ugly popcorn texture. This Franklin Tennessee resident (yes, Franklin is one of our favorite towns in the country! We even went house hunting there many, many moons ago while studying at Vanderbilt Law School and contemplating living in the Nashville area after graduation) not only made it all work together but was able to completely transform her kitchen for about $6500 including the beautiful new stainless steel appliances. 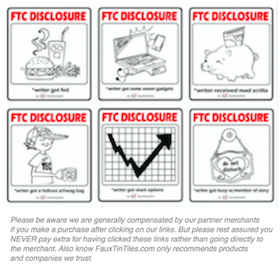 According to her blog post, it took the Tuckers about a day and half to install the ceiling tiles and they spent approximately $400.00 on the tiles themselves. 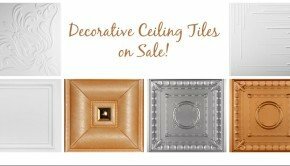 They choose Decorative Ceiling Tiles R 74 Coronado Styrofoam Ceiling Tile. This particular tile has enough dimension and pattern to make it interesting but not so much as to make it overly busy and distracting in a classic yet modern kitchen. 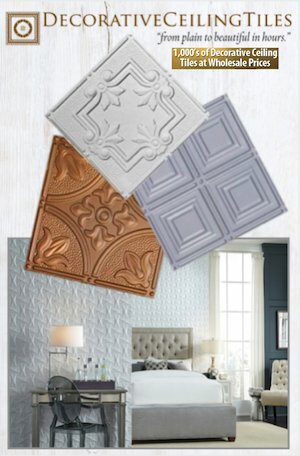 Alternatively they might have chosen R 24 Line Art Styrofoam Ceiling Tile, my other favorite tile with an even simpler vintage tin tile pattern. These styrofoam tiles measure 19 5/8″ x 19 5/8″ and are paintable with water based paints. The standard white tiles cost just $3.99 each. This pattern is also available pre-painted in antique silver and antique copper colors for $9.99 each. You can calculate exactly how many tiles you will need directly on the product page (Remember to add a 15% overage just in case you mess up a tile or two – take the minimum number of tiles needed and multiply it by 1.5.) 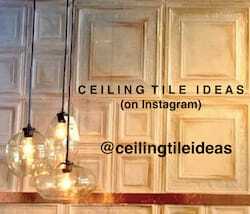 Milan at Decorative Ceiling Tiles suggests using Loctite Power-Grab to glue your tiles up. You will also need an exacto knife with a few fresh blades, measuring tape, a straight edge , and some white caulk. 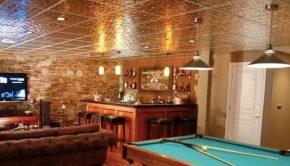 Milan has made a very detailed HOW2 install decorative styrofoam ceiling tiles over popcorn ceilings video that might be worth watching before you begin your project. So here are the after photos – all we can say is WOW! 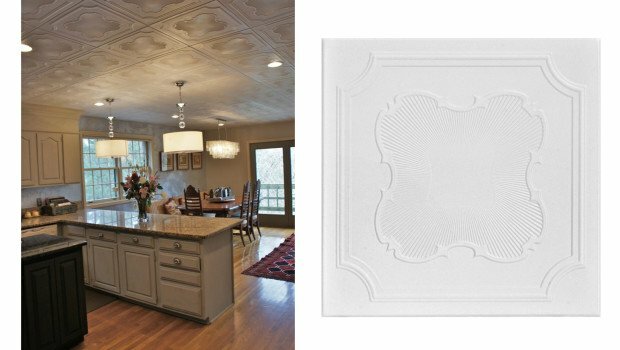 Summary: We are obsessed with decorative ceiling tiles and now we have visual proof of their amazing ability to to completely transform a room from drab to fab in a few hours. More specifically they are a beautiful solution to a common problem - torn apart and ugly popcorn ceilings.